How Does Music Stimulate Left and Right Brain Function? Why is this Important? ? The right hemisphere engages in synthesizing several different parts to create a cohesive whole when processing new information (Williams). Almost nonlinear in processing information, the right brain is adept at visual imagery. The left hemisphere, sequential and linear in its data processing, moves step by step when processing new information (Williams). Just like any part of the body, any activity that stimulates the brain helps increase its overall functionality. While most activities like visual art, computing, and language largely work in only one hemisphere, music is one of the few activities that stimulates both sides of the brain. The right brain, often considered the more subjective and creative hemisphere, focuses on the melody in music. The left hemisphere, considered the analytical part of the brain, is responsible for the understanding of musical structure and motor skills, such as playing the violin (Yoon). Rhythmic structures uniquely affect the brain extensively, such as supplementary motor areas and the basal ganglia, especially when compared to musical styles lacking a steady beat pattern (Phillips-Silver). Nonmusical activities, such as walking or martial arts, also aid the brain bilaterally when combined with a steady rhythm (Manjul). Please feel free to share your thoughts on the benefits of music education in the comments section below. Networking is a great way to be informed of the research so that we can educate students and schools about the great benefits of learning music.We’d love to hear from you!! Legg, R. (2009). Using music to accelerate language learning: an experimental study. Research in Education, (82), 1-12. Retrieved from the Professional Development Collection database. Schellenberg, E. (2005). Music and Cognitive Abilities. Current Directions in Psychological Science (Wiley-Blackwell). 317-320. Vitale, J.L. (2011). 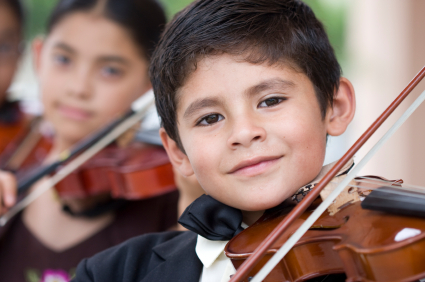 Music Makes You Smarter: A New Paradigm for Music Education? Perceptions and Perspectives from Four Groups of Elementary Education Stakeholders. Canadian Journal of Education, 34(3), 317-343. Netherwood, C. (2007). Music to your ears. Autralian Parents, 64. Yoon, J. (2000, January 1). Music in the Classroom: Its Influence on Children’s Brain Development, Academic Performance, and Practical Life Skills. Phillips-Silver, Jessica. (2009, June). On the Meaning of Movement in Music, Development, and the Brain. Contemporary Music Review. Vol. 28, No. 3, pp. 293-314. Williams, Linda. Teaching for the two-sided mind: a guide to right brain/left brain education. Simon & Schuster. 1986. Bajaj, Manjul. Personal Growth – Cross train your brain. Lifepositive.com. http://www.lifepositive.com/Mind/Personal_Growth/Cross_train_your_brain12003.asp. Moreno. S. (2009). Can Music Influence Language and Cognition?. Contemporary Music Review, 28 (3), 329. This is a fantastic article. I’m an instrumental teacher in rural Victoria rebuilding a music program at the local high school. I also do occasional presentations for local first-time mothers groups. Would you mind if I used your article in my work? It will be fully creditted, of course. I would be delighted if you could use this article in your work. It was written to be used exactly for that purpose- I really appreciate you getting in touch and crediting it as well. Synapse transmission between neurons in different systems of dimension . Throughout many centuries, the musical structure has had numerous modifications. We can observe the constant use of digits for convenience of notation of the music sounds, for example : digital organ bass, lute tablatures, guitar jazz ciphers. At nowadays the digital system of music teaching is absent in curriculum and is not applied in practice because of teacher’s insufficient professional knowledge in the sphere of child’s neurophysiology . The findings of our scientific investigations have permit us to understand the most delicate mechanisms of child’s mental activity and to detect new creative abilities.Application of the information technologies will help schoolmasters to improve the quality, speed and efficiency of music teaching for beginners. The scientific methods “Digital Music Grammar“ and “ Algorithm of Microcycles “ are dedicated to children on the development their intellectual and creative abilities. Great compilation of information! May I reference your article (with proper citation, of course)? Yes -of course Tim. Thank you so much for asking and I’d be thrilled if you can use this article. I also saw a documentary re: a family w/ at least 6 children, all autistic, and the significant gains they made in and out of school when the parents made listening to classical music a part of their day. Great Article! To hear researchers affirm what I see happen in the classroom when music is an integral part of the community. This article is the reason I still teach general and choral music at the elementary level! Janice, I teach beginning piano to older adults at our Adult School. The class evolved out of our Older Adult Co-ordinator to bring a music class that would help to keep seniors using their brains. She also has a program called “Memory Boosters” where the students learn techniques for helping their brains thru diet, exercise,different types of mind games & puzzles. This came abut because of a program that she has for Alzheimer’s & Dementia people who are cared for by a family member to give that family member two days respite. I am going to share this article with her to pass along to her Memory students as well as sharing it with my piano students. I have one lady who will turn 82 years old this week. I love doing what I am to help other Seniors learn to play the piano . Thanks for sharing your inspiring story with us Pat : ) Your program sounds amazing! Yes absolutely- you can link to this article from your school website. All that we ask you to do is acknowledge where you got it from on your website. Thank you for a clear and concise article! I teach music 3 to 93 year-olds and it is amazing what music does for every single individual!I am presenting at a conference and would like to make reference to your article, if you’ll allow me, giving you credit for it of course. I came across research such as this whilst doing my post-graduate study in Music Psychology in Education and have adapted my teaching to incorporate this information. I have also tried to keep colleagues informed so that they too can inform parents and students alike as to the current thinking in music research. It’s good to see that people such as yourself are getting the information out to the general public. You’re welcome Jon- Thanks for your feedback and kind comments. I am in charge of our NEW Music Booster Newsletter and I’m wondering if I could use parts of your articles, giving credit to your site/authors, in it? This a beautifully written article! I run two piano studios with students of all ages. I just finished a Master Class to our more advanced students this week where I taught the left-right brain concept in regards to music. Could I have your permission to post a link on our studio Facebook page? It would greatly help their understanding of this concept. I also give a presentation to teachers nation wide on a beginning group theory course. I would love to quote from your well written article. May I have your permission? Paula I would be honoured if you’d like to make reference to this article- thanks so much for your kind words. Yes absolutely- you can link to this article from your studio Facebook page. And with the presentation- all that we ask you to do is acknowledge where you got it from. Thanks for such a concise, easy to read article that reinforces what those of us who are music therapists have known for a long time. Everything you mentioned is “used” extensively in most therapeutic settings–it’s nice to have something to put in peoples’ hands when they question the validity of what we do. The only thing missing in most of the things I’ve read is using music for fun. Music has incredible benefit in so many areas of our lives. Let’s not forget the pure joy that it brings! I am writing to you as the editor of the Kodaly newsletter in Victoria Australia. As such I was hoping we may be given permission to reprint this fantastic article in our next newsletter? (Fully credited to you of course with a link to your website. I look forward to hearing from you if this is a possibility? I have always wondered why it was difficult to impossible for me to play the piano, as I have always wanted to. I love music and love to listen to it, and would love to be able to play. But I’m always frustrated. I am a very creative, very right brained artistic person. I doubt my left brain ever even gets used! Now I understand that listening to melody is a right brain activity and playing is a left brain activity. Totally fits in. Now I understand. Thanks. I have been researching music and learning for many years. Can I quote you on this? What is your last name? I came across this after reading your article. Seems to go hand and hand with yours. Check out the video, How Playing An Instrument Benefits your brain. Do you know the parts of the brain that is used to play the violin? Hi Samuel – that is a question someone more qualified than I would have to answer – however a great idea for a follow up article, so we may look into this in the future! Wow Janice, your article has brought me tears. Because listening to music has always been a sort of therapy to me. Reminds me of five years ago when I was battling acute leukemia, in-between the chemo’s I have kept my iPod beside me to soothe me in trial times. Awesome! Thanks so much for writing this article! I’m writing an argument essay whether music makes people smarter or not, and this helps SOOO MUCH!!!! Is this mostly classical music that everyone is referring to? I’m sure that rap wouldn’t fit in bere. Please list a few of the pieces that would be beneficial.